Unfortunately, it’s common to witness trucks loaded with animals on the road being transported to the slaughterhouse, tightly packed together in a way that no creature on earth ever should. I often feel that the poor things know exactly where they’re headed, and what’s about to happen to them. And after coming across this story, I couldn’t be more certain of it. Some time ago, in Australia, a motorist was driving along the road behind one such truck, unaware of what it exactly it was carrying. Suddenly a pig’s head appeared above the edge of the truck, at which point the driver immediately understood exactly where the truck was headed. But among the pigs on the truck was a four-month old who had no plans of arriving at that destination. Then, suddenly, to the driver’s amazement, the pig jumped out of the truck as it was moving at full speed along the road. 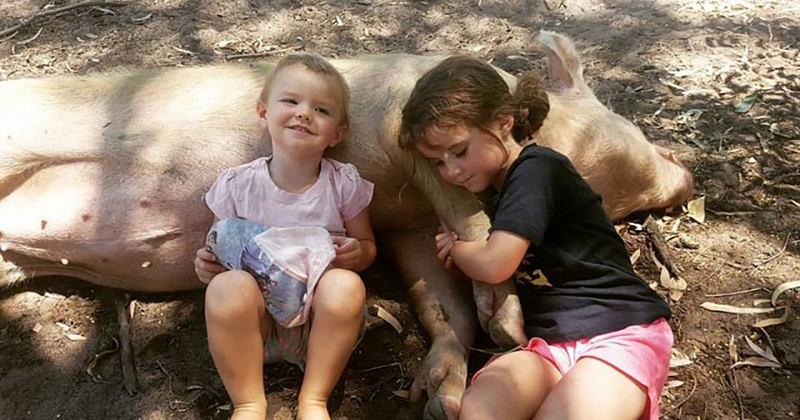 Clearly, this little pig had its freedom — and life — in mind. 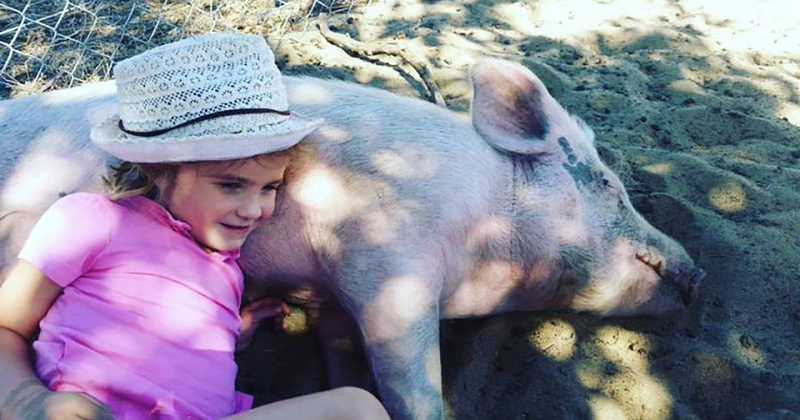 The driver stopped immediately to check on the pig and discovered it was seriously injured, but still alive. 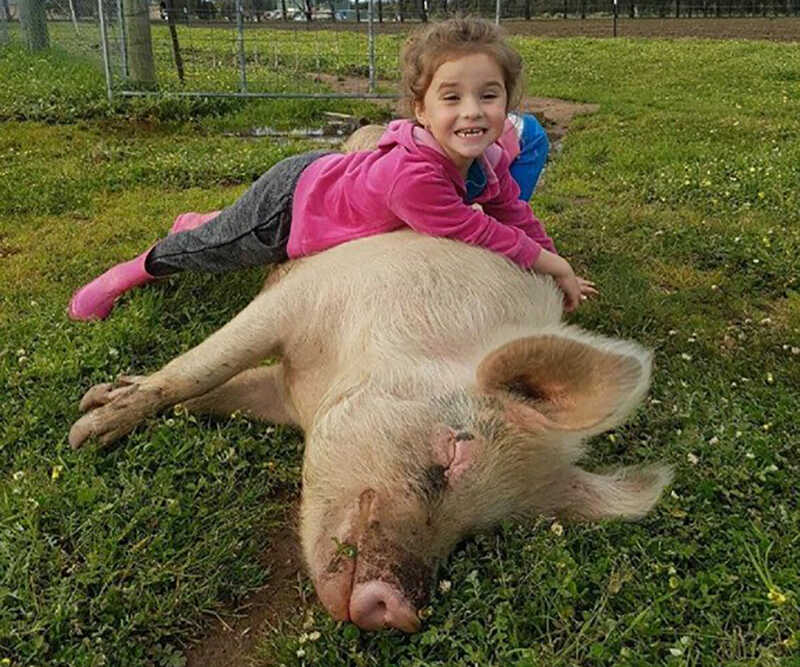 The animal friend picked up the pig and drove it straight to the animal welfare organization Mandurah Wildlife Rescue. The pig was treated immediately, but it was badly injured and no one could say if it would survive the night. But it turned out that this little pig was a real fighter, and miraculously, it survived the night. They called him Wombat. Since this momentous day, Wombat has had an amazing life — all because he was brave enough to jump off the truck that fateful day as it moved at full speed. Today, Wombat is a big and happy pig. He still has some scars, but it’s nothing compared to what he would have had at the slaughterhouse that awaited him. Today he lives on the wonderful Greener Pastures Sanctuary, which houses ill-treated and otherwise vulnerable animals. “Often he just lies there and cuddles with the children that visit. I think he could spend the whole day like that,” says Rachael Parker, the founder of the park. Share this story if you agree the driver that stopped and took Wombat in did the right thing. Published by The Animal Bible. Please share.